ABBYY is a world leader in development of document recognition, data capture and linguistic technologies. ABBYY's award-winning FineReader OCR software converts static paper documents and PDF files into manageable electronic data, saving you time and effort. ABBYY FormReader is a powerful data capture platform used by business users, large enterprises and governmental agencies to process thousands of forms daily. And ABBYY's document recognition SDKs have won acclaim from software developers and VARs that have integrated ABBYY technologies into their own applications. 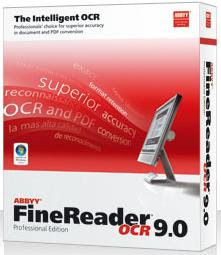 ABBYY FineReader 9.0 Professional Edition, an intelligent OCR and PDF conversion application, has been designed to meet the needs of professionals who demand the best recognition accuracy and format retention. The newest version of ABBYY’s award-winning productivity application allows users to effortlessly turn PDF files, scanned images and digital photographs into truly editable and searchable formats. FineReader’s revolutionary Adaptive Document Recognition Technology (ADRT™) analyzes an entire document as a whole rather than discretely as individual pages, and precisely reproduces it with original layout, style and formatting attributes. FineReader’s new Results-Driven interface and single-click QuickTasks™ make conversion easier, faster and more accurate than ever before.